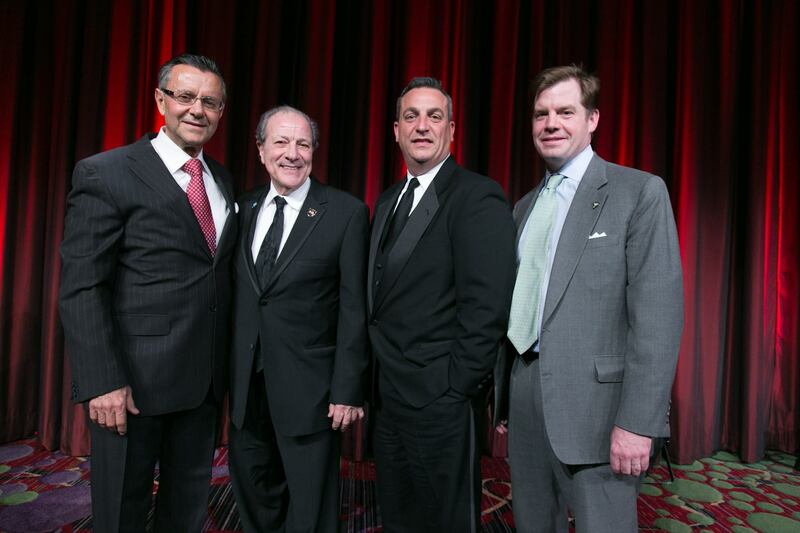 At its Spring Gala and Auction on Thursday, March 30, HeartShare Human Services honored Salvatore B. Calabrese of RE/MAX Metro, actor Dan Grimaldi, Ph.D., Gary J. Perone, Brooklyn Cyclones Manager and Blakely C. Page of Spouting Rock Financial Partners. HeartShare raised $500,000 at its 2017 Spring Gala and Auction on Thursday, March 30 at the New York Marriott Marquis. At the annual fundraiser, HeartShare honored Salvatore B. Calabrese of RE/MAX Metro, actor Dan Grimaldi, Ph.D., Gary J. Perone, Brooklyn Cyclones Assistant General Manager and Blakely C. Page of Spouting Rock Financial Partners. Gala honorees are long-standing advocates and supporters of the organization, as well as acutely aware of the hardships facing the differently abled. “I’ve been coming to this Gala for a decade. My adult goddaughter participated in a HeartShare day program and I recently found out that my cousin has been receiving residential services from HeartShare for 25 years,” shared Gary J. Perone, Assistant General Manager of the Brooklyn Cyclones and Recipient of The HeartShare Genie Foundation Award. During the evening, HeartShare also raised $40,200 during a mobile campaign. Guests texted their donations after viewing a video featuring Carol,* who was told that she couldn’t work or live independently because of her disability. “When I was younger, kids would tease me, ‘Oh, you are handicapped. Oh, you can’t do anything.’ Today, I live, work and commute on my own and I’m proud to say, I can do more things than I thought I could do,” she said in the video celebrating her independence and how HeartShare helped her get there. HeartShare President and CEO Bill Guarinello and Chairman of the Board Paul Torre thanked other notable guests for coming out to support the agency, including actor Danny Aiello, The Sopranos’ Dominic Chianese, Robert Iler, Jason Cerbone and Artie Pasquale, actress Barbara Feldon (“Agent 99”), CBS Blue Bloods’ Abigail Hawk, Orange is the New Black’s Barbara Rosenblat, Q104.3’s Shelli Sonstein, and Fox 5’s Ines Rosales. Q104.3 Radio Host and long-time HeartShare Board Member Jim Kerr served as Master of Ceremonies. Fox 5’s Rosanna Scotto and actor Sean Ringgold, both on Boards at the agency, encouraged the crowd during the mobile campaign. HeartShare’s silent auction featured items like Yankee Legend, Mets Delta, Neil Diamond concert, Broadway and late night tickets, restaurant gift certificates, warm weather getaways, handcrafted and fine jewelry, a three-foot chocolate bunny and sports memorabilia. More on HeartShare’s Developmental Disabilities Services at www.heartshare.org.